Vice President This position is a two-year commitment to serve in leadership of the organization. The Vice President chairs the membership committee and serves on the Executive Board. Middle School and College Level Representatives Each of these positions is a two-year commitment to serve in leadership of the organization. Duties include attending Board meetings and representing the concerns of middle and college level teachers/instructors and students. The level representative will solicit or write one article a year for the newsletter, support the program chair in finding presentations for the conference, and coordinate a level Share-A-Thon at the 2019 conferences. District Representatives Each of these positions is a two-year commitment to serve in leadership of the organization. This person will speak at Board meetings representing the concerns of science teachers in their part of Georgia. The representative will support membership in their district through disseminating information and supporting quality professional development in their area. Odd-numbered districts (1, 3, 5, 7, 9, & 11) are open for candidates during this election. 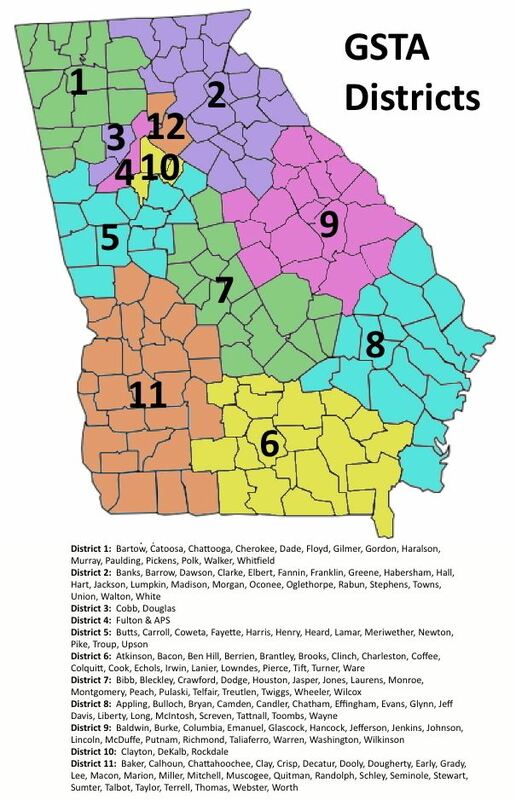 Check carefully to see if you are part of an odd numbered district should you be willing to serve as district representative.